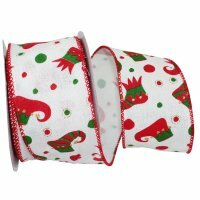 This Christmas Ribbon with an amusing Red & Green Jester Boots print is ideal for all your exquisite holiday projects! The Wired Edge of this Christmas Ribbon will bring body & hold making this ribbon ideal to work with! !